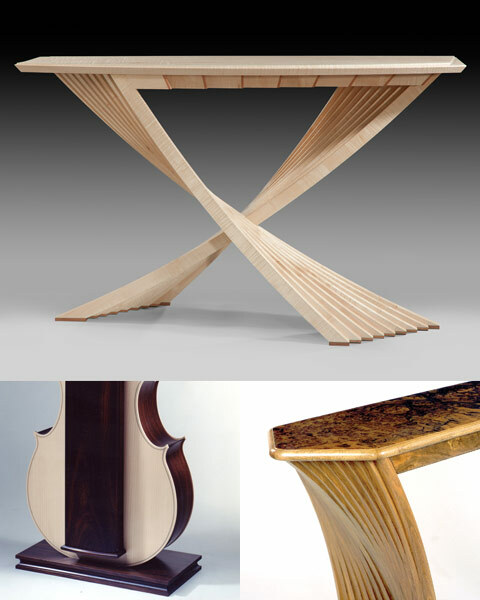 Sean Feeney now holds seven prestigious Craft Guild Marks awarded by The Worshipful Company of Furniture Makers, the latest of which was awarded in October 2011 for a bespoke side table named “Acer”. The Bespoke Guild Mark is awarded to an individual piece of furniture meeting the highest standard of design, materials, quality and fitness for purpose. The Company's prestigious Guild Mark for Bespoke Furniture was awarded to just thirteen pieces nationally during 2010. Recipients of a Guild Mark can justifiably claim to be one of the best furniture craftsmen in Britain. The “Acer” table seemingly defies gravity. Taking over 200 hours to create, it is made from locally sourced Warwickshire Sycamore: a luminous light wood that is traditionally used to make musical instruments such as violins and cellos, which radiates light and enhances the bold design. The attention to detail and function includes feet made from Perry pear wood, imported from Switzerland and loved for its close grained consistency, making it hard, durable and easy to maintain. Built for speculatively for inclusion in the 2011 exhibitions, it was submitted for judging in May 2011, and awarded in September (number 436). View all of the Sean Feeney Guild Mark awarded pieces in the portfolio. Read testimonials from past clients and contact Sean Feeney to make an appointment to visit the workshop or discuss your ideas.